Fact or fancy, Grenadier Pond's name is even part of its myth. ...plunged through a weak spot in the ice and drowned. More likely than not, if truth does reign supreme in this story, the drowned victims were probably British Grenadiers of the King's 8th Regiment of the Foot who were stationed at Fort York during most of these incidents. Either way, during the warm months, boaters and fishermen have reported a strange feeling of being watched from under the water and during the winter, skaters have had similar complaints. 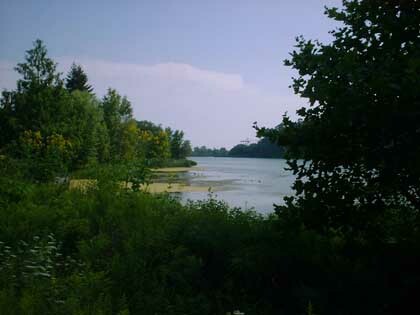 Update - Late June, 2004 - In addition to this report, Dr. Carl Benn, Chief Curator, City of Toronto Museums and Heritage Services and a well known historian and expert on the Battle of York and the history surrounding Fort York wrote to us about the "legend" of Grenadier Pond. Dr. Benn pointed out that the story of the pond is, of course, more than a little unlikely. In fact, any relation to the War of 1812 is highly improbable. Dr. Benn would be so bold as to say impossible. First, it is unlikely that there was much ice on the pond in 27 April 1813 when the battle of York occurred. Beyond that problem, there is no historical evidence whatsoever in a well-documented battle to support the tale. To quote Dr. Benn directly, "I would suggest that on 27 April, there almost certainly wasn't any ice at all on the pond, and probably hadn't been for quite some weeks, even allowing for both a slightly colder climate and an unusually cold winter." Dr. Benn points out that we do know that John Howard entertained officers from Fort York at Colborne Lodge and that they liked to fish at the pond, which might suggest the real origins of the story or, more appropriately, how the pond itself got it's name. For those interested in Toronto's military history (with an obvious emphasis on Fort York, the Battle of York and the War of 1812 in general,) we would strongly recommend Dr. Benn's outstanding book, Historic Fort York 1793-1993. I beg to respectfully disagree with Dr. Benn's statements regarding the possibility of some ice coverage as late as April on what is now known as Grenadier Pond. Ice coverage and duration is not dependent solely on extreme winter weather conditions as he has stated, but can result due to cooler water temperatures throughout the Summer and Fall months. Bodies of water as vast as the great lakes including L. Ontario have frozen over during average winters. Niagara Falls (American side) has frozen over at least three times in history, which resulted in the installation of ice-booms in 1964. As recently as 2001 ice lasted well into April on Lake Simcoe allowing for ice fishing on that particular body of water. Therefore, it is my opinion that some ice coverage as late as April is within the realm of possibility, unless of course Dr Benn has meteorological data or other supporting documentation for the date in question.